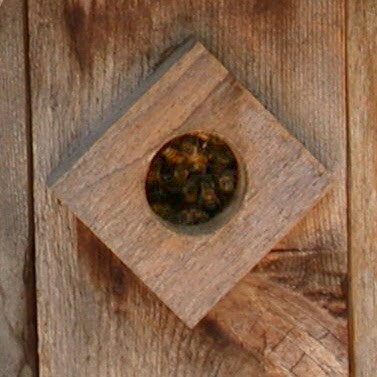 Just over a week ago fellow Backwards Beekeeper member Sandy mentioned that I could have the bees that were in a birdhouse at her home. The caveat was we needed to extract them from the birdhouse. Since the swarm that had graced our compost bin the week before had left, we were prepared and very willing to do whatever was needed. As an initiate I asked the knowledgeable John Lyons to help out with the task. 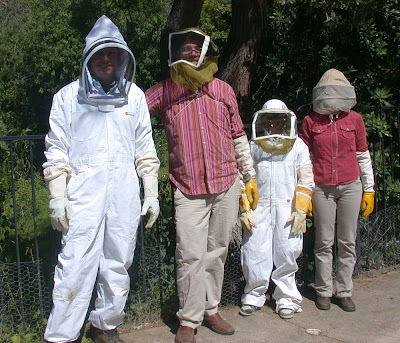 John, his son Arjuna equipped in his bee suit, Greg and I descended on Sandy's home at 9am. We were greeted by her husband Micheal who was very gracious and offered to help out. Michael had recently experienced a rather unfortunate event with bees thus he outfitted himself in his Darth Vader-esque white bee suit. I wore my vintage Parisian veil purchased on Etsy and elbow length bee gloves. Here we are pictured below, from left to right Michael, John, Arjuna and myself. Greg who was without any bee gear was our official photographer. The little wooden birdhouse sat on top of an air conditioning unit toward the back side of Sandy and Michael's home. After surveying the scene the birdhouse was moved out to a more manageable location. Our smoker, filled with local road apples, was cranked up for the first time. John then carefully began removing each of the boards that made up the roof and walls of the birdhouse. 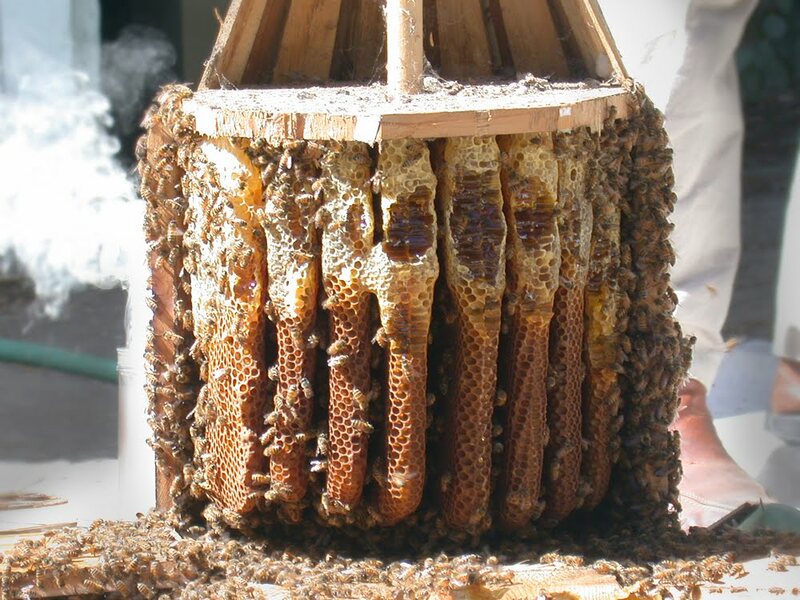 Once half the boards had been removed we all stood back in awe as we observed how the bees had organized the combs like cards in a rolodex. The creativity of the honey bee is quite spectacular. Next the more vital portions of the combs were cut and placed on the frames which had already been prepared with starter strips. Each piece of comb was held in place with hemp string. 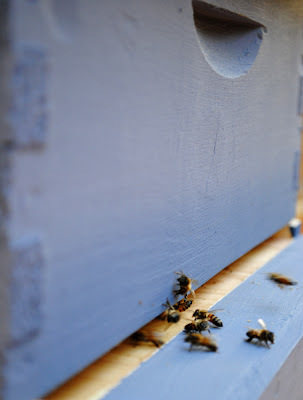 The frames were slid into the bees new temporary home, a nuc box. While John worked on cutting and attaching the comb Michael and I brushed the bees into the nuc box. In the meantime Arjuna had discovered the honey stores and was contenting himself with the liquid gold elixir. When all the frames were filled with comb we placed the top onto the nuc box. 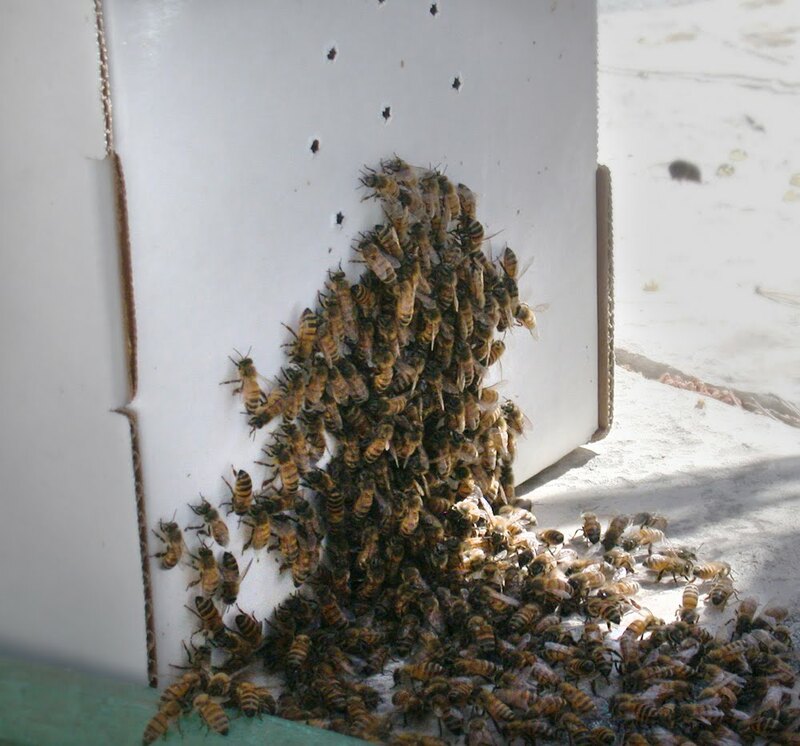 All the stray bees slowly marched into the box following the scent of their queen. John refers to her natural perfume as Eau de Royal. In the meantime we gave Michael the comb with honey as a thank you for this extraordinary gift. It takes a village to raise a child and it takes a great team to quickly and effectively transplant a colony f bees. 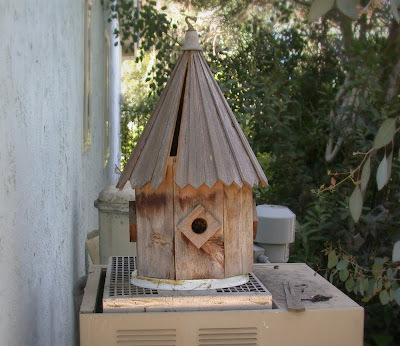 Once the bees had made their way into the box, we placed it on the ac unit where the birdhouse originally was located. This way all the field bees would easily find their home. We bid everyone good bye and headed homeward to discover that our neighbor was moving and the perfect sized table for the hive. How fortuitous! Greg spent that day preparing the location and adding tanglefoot, as Micheal had done on his hives, to the legs of the table so as to prevent ant attacks. At dusk Greg and I returned to the scene thinking we would simply seal the nuc box opening, tape the sides of the box and bring it home. Not! When we arrived a large amount of bees were bearding on the outside of the box. We tried our best to sweep them in but had very little luck. 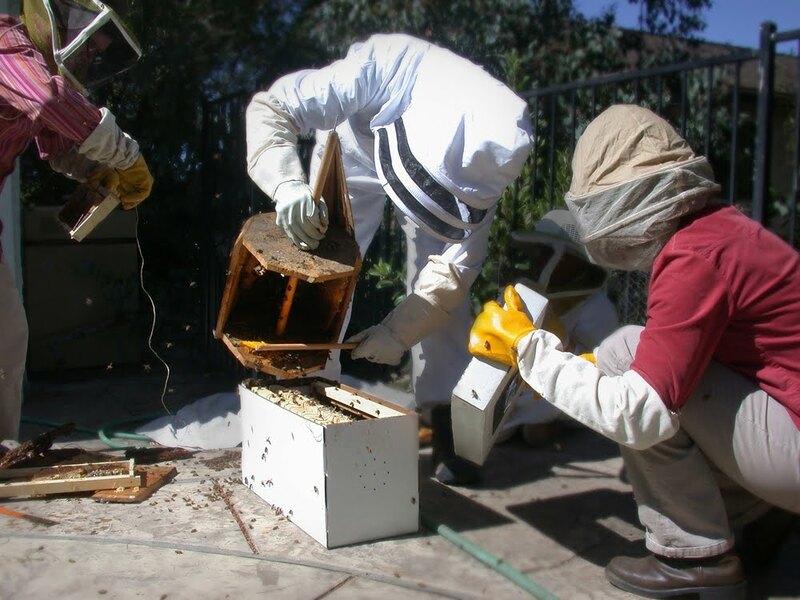 Later when I told John about our challenge he mentioned that it was likely the bees were very warm inside the box. 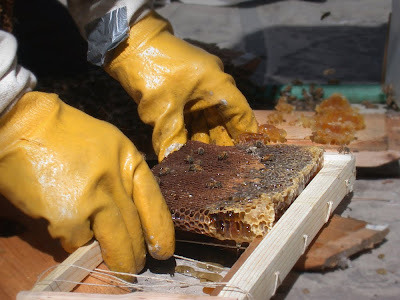 Back at chez Spalenka Villa we placed the nuc box where the permanent hive would be, removed the tape from the sides and unplugged the opening. The vibration and bee hum wafting out from the box was like listening to the om chant of one thousand devotees at kirtan. 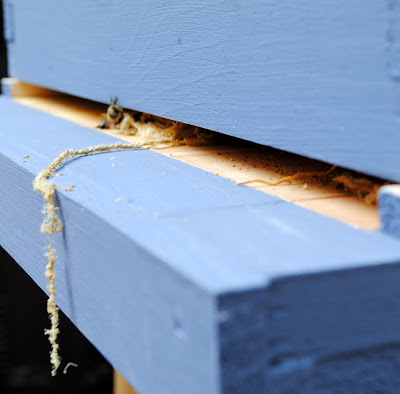 Since then we have moved the frames into the periwinkle colored box where the rockin' birdhouse bees now dwell. I placed a rock with holes into a terra cotta pot saucer which I add water to each day. 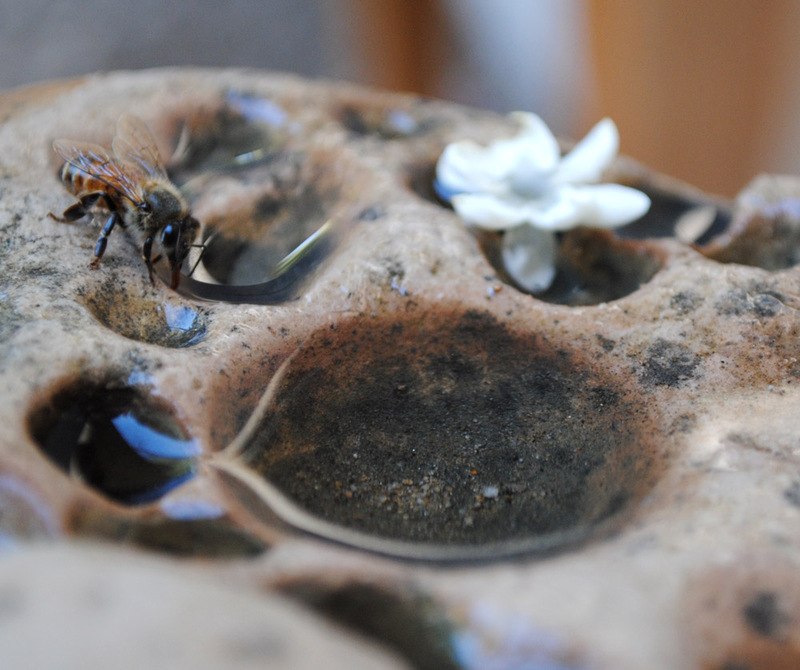 This gives the sweet little bees a nice place to drink and refresh themselves. Each day we observe them in complete fascination. 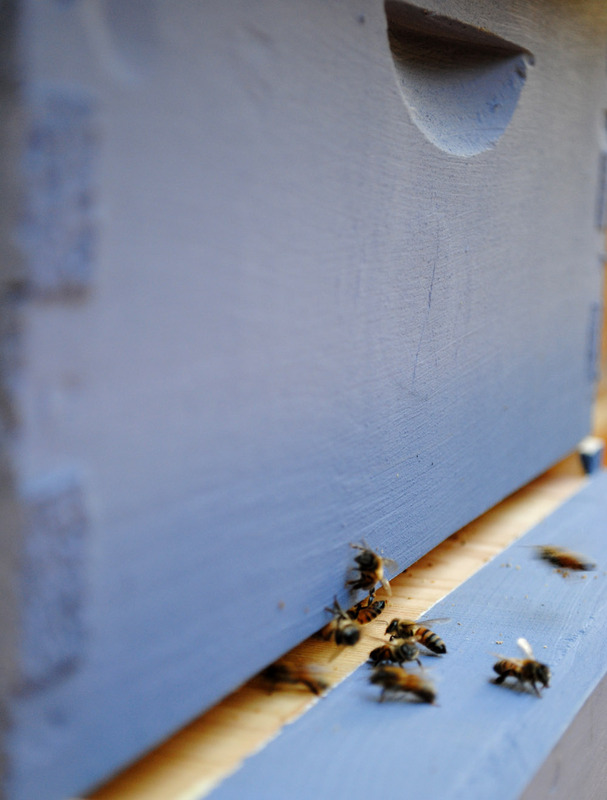 Besides their daily tasks and duties the bees have been fastidiously removing the loose pieces of string that held the comb in place. I am so grateful to John Lyons and the Backwards Beekeepers who have been tremendously helpful as Greg and I enjoy this adventure into beekeeping, where backwards is the new forwards. Lovely account and terrific photos. John, you are like sweet sunshine. 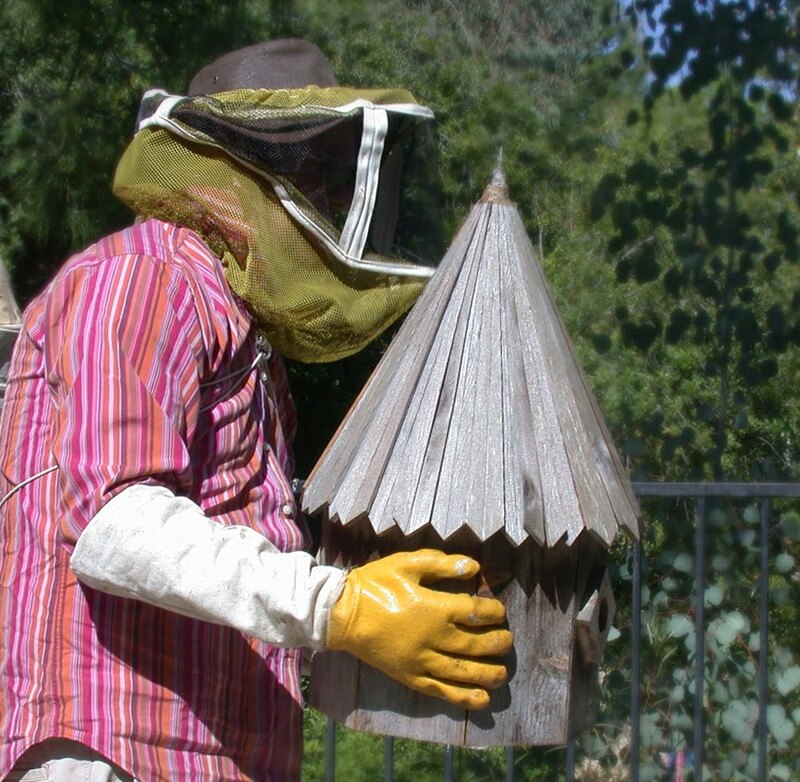 Thank you for your gracious assistance with the bees and your presence in our lives. Ah Roxana ~ what a beautiful bee story! Such amazing little creatures, you truly are blessed to have them! 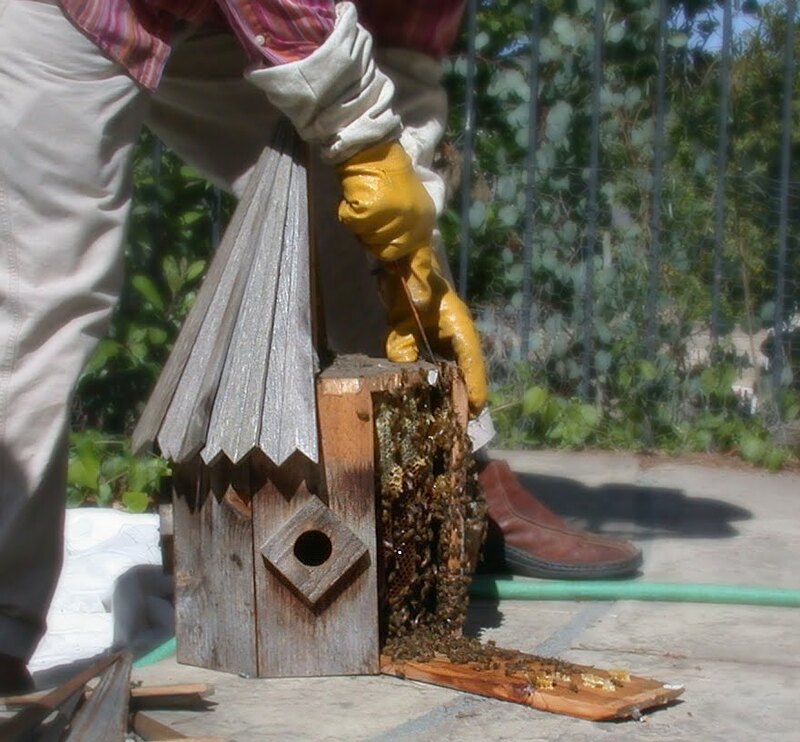 I initially found your comment on the Backwards Beekeepers blog and followed your link to your blog. What a very nice story! Great photos, too. I'm looking forward to browsing through your Etsy site as well. I design jewelry as well and would like to send you some photos of my pieces. 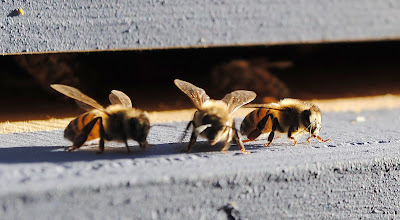 I also have a brand new "bee blog", sweetbeeapiary.blogspot.com. Please visit and leave your comments! SweetBee, thanks for stopping by. How fun to have a fellow blogging buddy and fellow bee neophyte! What is the feminine word for fellow, hmm? I read your post about "Perfume" and the books you enjoyed first, then this post about bees, and though I would recommend "The Secret Life of Bees". I enjoyed the story, but especially liked the movie because seeing the beekeeping equipment and workroom brought back memories of my father, who was a beekeeper. Helping him with honey extraction was among my favorite memories of him.